To truly understand my Dutch heritage, I cannot ignore the significance of the Reformed Church of America (RCA) on the lives of my Dutch relatives that immigrated to Detroit, Michigan and its surrounding areas. Unlike many of the Hollanders that settled in western Michigan around the Grand Rapids area, those settling in Detroit chose to assimilate as much as possible into American life. But they clung to one common thread from their homeland, their church. By the time, the Reysts and Smouters arrived in Detroit between mid-1880 and mid-1890, the First Reformed Church of Detroit was firmly established. Officially organized on November 30, 1872, the church had built a permanent building in 1875 on the south side of Catherine Street between St. Aubin and Dequindre Streets (in the quadrant which is now I-75 to the west, the Terminal Railroad Line to the north, Conant St. to the East, and the Davison Freeway to the south), nestled between Highland Park and Hamtramck. Plans were already in progress to build a larger facility on an adjoining lot to accomodate the growing congregation. This church building would be completed in 1895 and dedicated on February 9, 1896. This was the church in which my grandparents, Cornelius Reyst and Adriana (Jenny) Marie Smouter, were married on January 25, 1911, and my father, Arie, would later be baptized and raised in. Church services (one in the morning and one in the evening) were conducted in Dutch until December 14, 1916 when the evening service was converted to English. However, the increasing bilingualism of the younger members is evidenced by minutes of the consistory which revealed that when Sunday School began in 1878, it was conducted in the English language. As the church membership grew through both marriages within the congregation and a continuing influx of immigrants from the homeland, the location on Catherine Street was no longer desirable as many members no longer lived in that area but had moved further east in the city. So new lots were purchased on Helen Avenue at the corner of Stuart, near Gratiot Avenue and E. Grand Blvd, and the last service on Catherine St. was held on June 29, 1919. The new church building was finally completed in 1921 and dedicated on July 9, 1922. At this time, the church membership, which had grown to almost 200 members, still consisted mostly of Dutch descendents. Like my grandparents, it was not unusual for the younger members of the church to marry another member of the church. In an effort to reach out to the community, the church would embark on 2 missions and organize churches in other neighborhoods within the city limits – Nardin Park Reformed Church on the west side and Hope Reformed Church on the city’s east side. Around this time the main church services in the morning and evening would now be in English with an afternoon service still provided in Dutch. It was here that my parents, Arie Reyst and Mildred Stapleton, were married on September 16, 1939 by Reverend J.J. Hollebrands. Pastor Hollebrands was the longest serving minister in the history of the First Reformed Church of Detroit. Accepting the call in 1928 he would successfully lead the church for 19 years despite the difficult years of The Great Depression followed by WWII, which deeply affected the church even before the United States’ entry into the war. During his tenure the church continued their interest in “mission” projects, leading to the organization of several other Reformed Churches in the metropolitan Detroit area immediately following WWII. While tracing our Reyst family heritage I would discover to my surprise that Reverend Hollebrands’ son, Edwin, married our first cousin, 2x removed, Helen Evelyn Reyst (daughter of Peter Reyst, who was my great-grandfather’s younger brother). Their two sons, Jay and Lynn, both of whom I knew growing up, are my second cousins, 1x removed. This would be just one of the many discoveries that I am related to more church members than I ever knew about. Very interesting, Lynda. I really enjoyed reading this! I was the successor to Rod Jackson and served FRC from 1981-1986. I knew Ed and Helen Hollebrands well; they were very supportive of me during my time there. If you would like to know more about those years, we can correspond via email. Would love to correspond further with you via email. I did see your recent email but it was a busy week with my daughter in town from Grand Rapids. ADDENDUM: I am the pastor who followed Rod Jackson. (Rod was killed in an automobile accident a few months after he moved to Orange City, IA.) I served with the congregation from 1981-1986. I was born in Zeeland, MI and grew up in SW MI between GR, Kalamazoo, and Holland; a farming community called Hopkins. I graduated from Central College in Pella, IA in 1997 (where I met my wife, Janna Koskamp Kisner; her great-grandfather, Arent, emigrated from Aalten, Gelderland, NL. Janna is a professional church musician and educator). I am a 1981 graduate of New Brunswick TS (class valedictorian). Our oldest daughter, Julia Beth, was born at St. John Hospital on Moross (7 Mile Road) on 6/23/82. She currently is Associate Director of International Studies at North Carolina State University in Raleigh, NC. In 1986, my family and I moved to Louisville, KY where I completed a PhD in theology from Southern Baptist TS in 1989. From 1989 to 2016, I taught undergrads at Waynesburg University in SW PA (Greene County, bordered by WV to the south and the west). During our time in Waynesburg, I was part-time interim pastor and stated supply pastor with 12 different congregations in Washington and Fayette Counties, PA. Our youngest daughter, Jesse Morgan, was born at Greene County Memorial Hospital in Waynesburg, PA on 10/17/91. She currently teaches art to public school children in Charlotte, NC. We retired to Roxboro, Person County, NC to be within an hour of our grandsons (Julia’s) who live in Cary, NC. Presently I serve with the Oak Level Presbyterian Church in rural Halifax County, VA as their transitional pastor. Our home is just 40 minutes from the church. The good folks at FRCD were very patient with their rookie pastoral leader. Ed and Helen Hollebrands were very supportive of our ministry at FRCD. Surnames of consistory members were Aardema, Arndt, Brouwer, Dunn, Dykstra, Elzerman,,Fisher, Garner, Hoogstra, Lo Piccolo, Plavier, Melaas, Russell, Siecinski (Rod Jackson’s daughter’s husband) Smeitink, Stelma, Vanden Esschert, Van Houzen, Van Wingerden, Van Zomeren, Vaisey, and Walker. Reysts in the congregation (in addition to Helen Hollebrands) included Virginia Reyst Hagstrom of Lexington, MI, and Catherine Reyst Cook of St. Clair Shores, MI. Smouters were Jeanette Smouter Melaas of Roseville, MI, Mamie Smouter Panke of Detroit, and Betty Nunedge Smouter of Warren, MI The church never ordained women. The church had one African American female member during those years. According to Ruth Wilson, RCA Elder at Church of the Master (formerly Faith Community Church, Detroit [on Moross]), only the Vaiseys are still living in 2018. I do not recall, but I may have met Lynda and/or her mother at congregational homecoming celebrations. 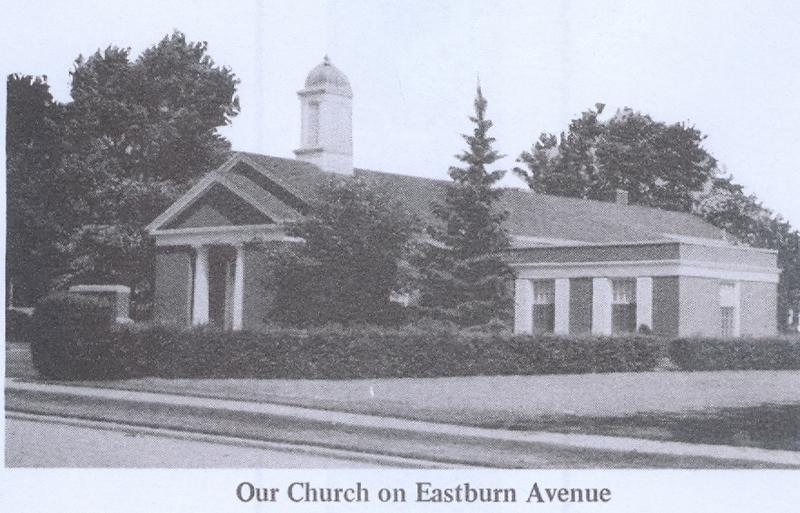 In 1987, FRCD merged with Church of the Master in Warren, MI, taking with them assets from the sale of the property on Eastburn and the decades of nurture in Christian faith they received from their Dutch Reformed forbears who worshiped God on Catherine Street, Helen Avenue, and Eastburn Avenue. Thank you for responding to my post. First Reformed Church was a strong foundation in my youth, and as you probably eventually learned the majority of its members were inter-related. Mamie Panke was my great aunt and Jeannette Melaas was my 1st cousin 1x removed (Jeannette’s father, Mamie & my grandmother, Jennie Reyst were siblings). Second cousins were Helen Hollabrands, Catherine Cook, Virginia Hagstrom, and Mae Jean Van Houzen just to mention a few. As you probably quickly discovered while serving there, there were a lot of inter-marriages among the Dutch descended members. Through ancestry.com and other research I learned that my families connections with the church date back to its beginnings in Detroit…my 2x great-grandmother’s sibling, Joannes (John) Nieboer, was a founding member per his obituary in the Detroit News. I am aware of the tragic passing of Pastor Jackson during an automobile accident during a snowstorm in Iowa shortly after leaving our church. In fact, I was the last church member he married (on June 14, 1980) before leaving for Iowa in early July. My mother, Mildred Reyst and my sister’s family (Kathleen & Denis Crosby) had moved to Kentwood, MI at the end of 1977. After marriage I moved to Dearborn. Their sister’s eldest daughter lived in both Cary, NC and Louisville, KY after marrying. Besides being a young pastor, you had a tremulous challenge in keeping our church afloat in those final years as the neighborhood was starting to drastically change. We lost a lot of young families when the church pursued establishing a new sister church, Church of the Master, in Warren. Two of my uncles, John Reyst and Arthur Breederland, were instrumental in helping establish that congregation. My older sister and her family also transferred there. I attended the recent anniversary of Church of the Master and got a chance to see LeRoy and Lynn VanHouzen who both recently passed away. It is still operating but membership is extremely low as they have been faced with the same issues as caused the closing of First Reformed. The other 2 sister churches in Detroit, Hope and Faith, closed also in the 1980s per the RCA archives in Rutgers, NJ. The mission church established by First Reformed in the inner city, Nardin Park, still exists but is operated jointly now by the RCA & CRC. Thanks, Lynda, for including my addendum in your heritage quest and for your kind empathy for our time at FRCD.